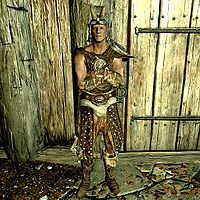 The Doorman is a Nord bandit found inside Redwater Den, a drug den for Redwater skooma. He wears studded armor, a pair of hide boots, a scaled helmet and a pair of leveled heavy gauntlets. He also carries alto wine and a leveled mace. He will ask you to keep your weapons sheathed while inside: "Hold it. If you're going downstairs, you keep your weapons to yourself or we'll be getting better acquainted." Afterwards, he'll say "Head on in and behave yourself." and keep to his post at the door. If still alive, he will be renamed to "Vampire's Thrall" when you leave. This page was last modified on 4 December 2012, at 07:42.